Noel Shaw (b.1932) was born in Belfast. He served an apprenticeship as a lithographic artist becoming one of Belfast’s foremost Designer/Illustrators. After working for many leading printing & advertising companies including 7 years spent in the art studio of the Belfast Telegraph, Noel moved to the Co. Antrim countryside to set up a fish farm where he pursued his interest in breeding and rearing trout. He maintained contact with the art world through a variety of freelance commissions, including a spell as technical illustrator with the ill-fated Delorean Motor Co. It was at this time that he began to take a serious interest in oil painting as a means of recording the rural life he loved so well, especially the characters and customs of a time gone by. His paintings are full of nostalgia with glimpses of a gentler time. 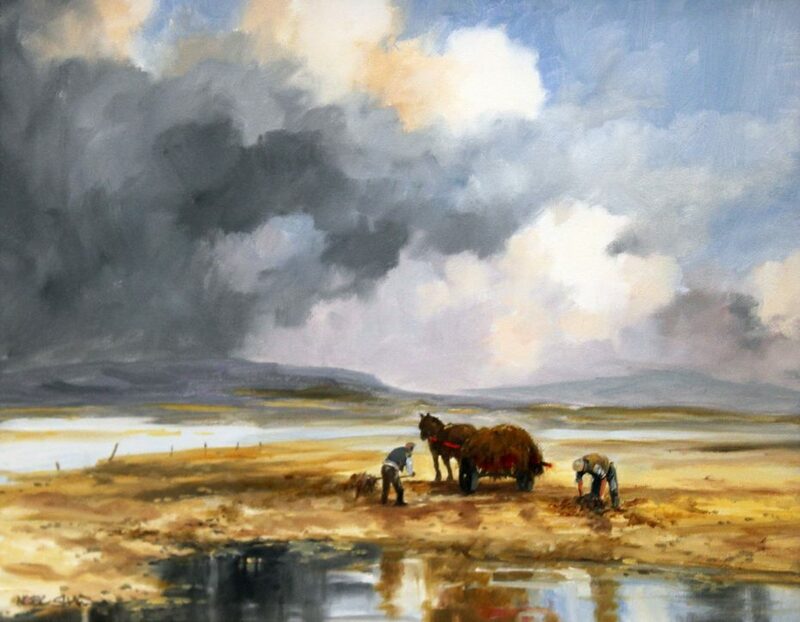 His love of the countryside and the people and animals who work on the land is evident in his paintings and is reinforced by his excellent draughtsmanship.